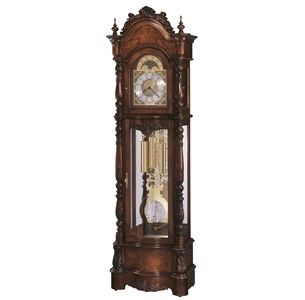 This Victorian style floor clock with a satin Windsor Cherry finish offers elegant details. An ornate pediment features bookmatched olive ash veneer crowned with a carved shell and leaf motif with two turned urn finials. The polished brass dial features a crystal cut glass center disk with polished brass, cast corner spandrels. The circular spun, silver colored chapter ring has applied brass Arabic numerals. The astrological blue moon dial includes pierced stars that are back lit. The polished brass lyre pendulum features a crystal cut center disk which complements the dial. The back is mirrored and the case is illuminated not by one lamp, but by two lamps. One lamp is located in the top to illuminate the stars and crystal cut center of the dial and the other lamp is located in the base to light the pendulum and polished brass weight shells. Frosted glass located in the base softens the glow of the light. The bottom door glass is serpentine shaped to match the shape of the door. Sculpted columns feature upper and lower carvings with complementing leaf patterns. The shapely, multitiered base features carvings on the corners framing the book matched olive ash burl veneer and a complementing shell and leaf overlay. The beveled top side glass panels are removable, which allows access to the movement.